Special kinds of buildings require special fire protection solutions. Simulations can optimise and verify individual fire protection concepts that differ from the standard. The costs and environmental impact are also lower than for real-scale fire tests. The applications of simulations range from simple volume fires through to large-scale fires and complex fire scenarios with sudden changes in conditions. Simulations are particularly useful for applications for which a real-scale fire test would be difficult to implement or where this would involve huge costs, such as for tunnel systems. 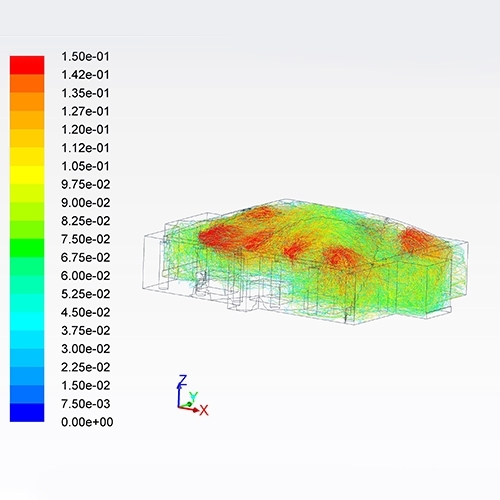 Our experienced CFD simulation specialists transfer the customer application to a virtual model. This is followed by the integration and arrangement of the AQUASYS high-pressure water mist nozzles and a corresponding simulation of the water mist dispersion. Years of experience ensures professional expertise and contributes to a correct and reliable system design.